The company violated a previous settlement with the Federal Trade Commission and 35 state attorneys general, the agency said Tuesday. Back in 2010, LifeLock was forced to pay $12 million in refunds to customers after the FTC alleged that it was using false claims to promote its services. The company promised to better protect its users' personal information, including credit card, Social Security and bank account numbers. But according to the FTC, it has broken that promise. LifeLock falsely advertised that it protects data with the same level of safeguards that a financial institution uses, according to the FTC, and falsely claimed that it protected consumers' identity "24/7/365" by providing alerts as soon as it became aware of a problem. The company disagrees with the agency's claims and is prepared to take the case to court. 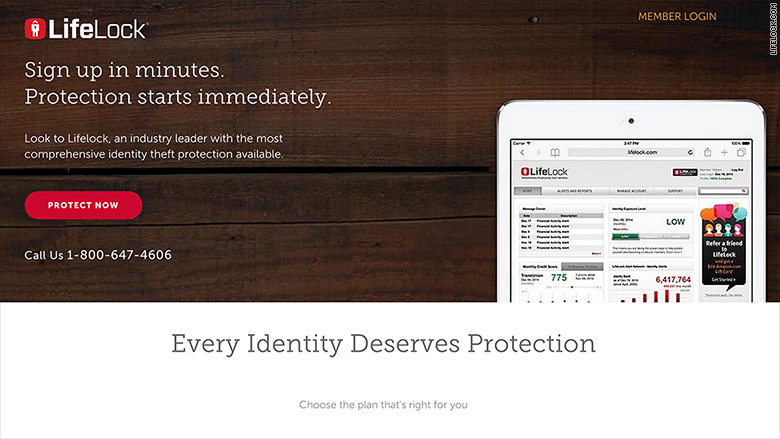 "LifeLock takes the accuracy of our advertising materials very seriously. The alerting claims raised by the FTC did not result in any known identity theft for LifeLock members," the company said in statement. LifeLock has about 3.6 million customers and charges subscription fees ranging from $10 to $30 a month for its services. It looks for suspicious uses of your personal information to get loans, credit and services and sends an alert if there's a problem. If a customer's identity has been stolen, the company pledges to spend up to $1 million on experts to help with their recovery. It was founded in 2005 and went public in 2012. LifeLock (LOCK) shares plunged as much as 43% Tuesday.